Gawande’s main premise is that the seemingly simple concept of creating a checklist for all areas of life can actually bring about more frustrations. Checklists are multi-faceted, ever-changing, and occasionally time consuming; despite the fact that they can also be life-saving, there is still often a resistance to using one. In a 2011 interview with the AHA forum, Gawande states, “To use a checklist, you have to be humble enough to think that you might fail.” This exemplified the unstated premise of the book, in that we as humans have a tendency to assume that we know everything. For a checklist to serve its intended purpose, we have to shed this notion, and allow ourselves to not only be wrong, but to have other people know that we were wrong (and by exactly how much). Our discussion eventually led to whether or not personality plays a role in one’s willingness to use a checklist. The question then became a “Type A vs. Type B” categorization for people who use them or do not use them, but that may only be a fraction of the acceptance/aversion notion. Perhaps it is better to think of this more in terms of Personal life vs. Professional life when looking at not only the type of people who use them, but how they use them. Gawande, Atul. 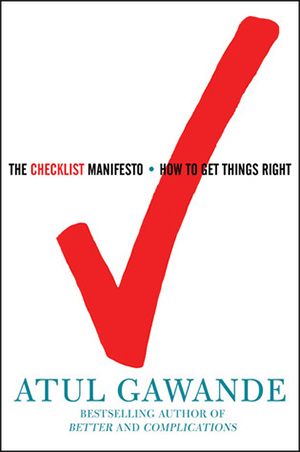 Checklist Manifesto, The (HB). Penguin Books India, 2010.